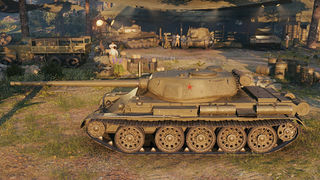 The T-54 first prototype is a Soviet tier 8 premium medium tank. 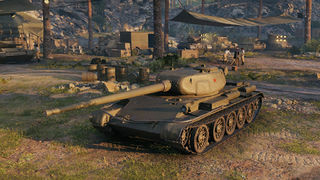 In short, the T-54 First Prototype is effectively a T-44 with increased armor and hit points at the expense of mobility and speed, or a Type 59 with reduced gun mantlet protection, increased upper hull plate, better gun handling, and full matchmaking. It makes up for its lack of speed with thick frontal armor, allowing it to effectively nullify many guns with less than 175mm of penetration, making this tank extremely dangerous at top tier. The upper hull plate thickness is 120mm, but the angling gives it an effective thickness of over 200mm at its weakest point, while the lower frontal plate of the same thickness gives around 160mm of effective thickness. With even a slight angling, the upper plate's effective thickness increases to 240mm, while the lower plate can reach 183mm, making it impossible to penetrate without the use of gold rounds for many Soviet vehicles using the 122mm guns, and nearly all tier 6 vehicles. The only actual weak spot is the turret, with the mantlet having 200mm of thickness with no armor behind it and a low-profile cupola located at the left side of the turret. 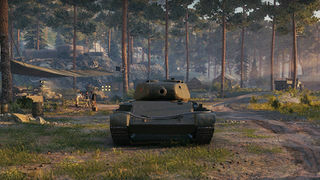 Needless to say, its armor is virtually useless against most tier 9 and 10 vehicles that it faces on a regular basis, so a less aggressive play style is advised as a bottom-tier. Despite its great armor, the offensive capabilities of this tank are rather limited; Having only 190mm of penetration on its AP shells makes it almost impossible to penetrate higher tier opponents frontally, and even sometimes struggling against the side armors of some vehicles. Thankfully, its Damage Per Minute is slightly above average, and its APCR shell has a decent penetration of 247mm, which can frontally penetrate most weak spots and side armor. Additionally, its premium vehicle status can help offset the credit cost of premium shells. While the view range on this tank is not very outstanding at 380 meters, its camouflage value is decent, which makes scouting viable with the use of concealment. This page was last modified on 18 August 2018, at 19:41. This page has been accessed 119,518 times.